Someone asked about balancing the assembly. Here’s what I did. First, you can always have the assembly balanced professionally. I was quoted about $90US for a four-cylinder. 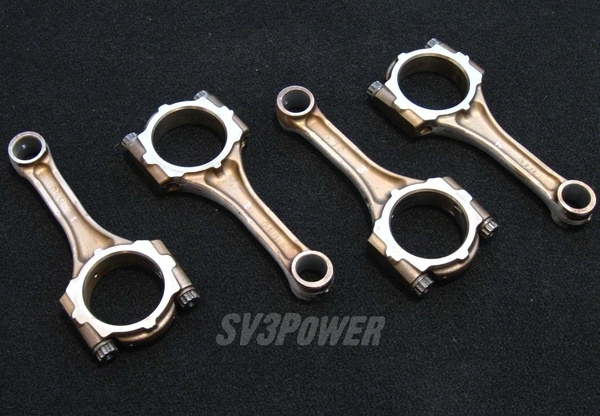 I figured that since none of the connecting rods had any sort of machine work on them, Toyota was not balancing the rods by themselves. With this in mind I figured they must know pretty much what a 7A-FE rod weighs and those weights must be fairly consistent. The crank, on the other hand, had a whole lot of holes drilled in the counterweights. Some of these holes are quite small, indicating a high degree of precision. It looks as though Toyota simply balances each crank and then chooses rods and pistons with weights reasonably close to each other. What it all means is that by matching the heaviest pistons with the lightest pins, that combo was as evenly matched as could be – within a two-gram spread. By matching the heaviest piston-pin package with the lightest little end, that combo was as evenly matched as it could be as well – less than one gram between them. Conveniently, the rods were consistent enough that total weight was very close (within two grams), and it worked out that by trimming a little bit from only two end caps, the big end weights all balanced to within one gram of each other, and most amazing to me, the entire assembly (piston, pin, and rod) balanced to within one gram total weight. This was confirmed on the scale before I assembled the engine. This was all speculation and, in hindsight, I wouldn’t try this again without confirming that the crankshaft had zero imbalance. At any rate, the engine is smooth all the way to (and sometimes through) redline.